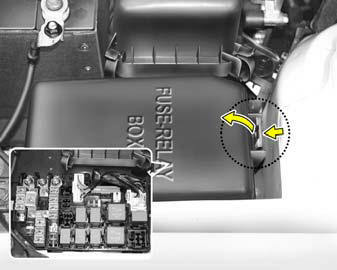 A fusible link will melt if the electrical circuits from the battery are ever overloaded, thus preventing damage to the entire wiring harness. (This could be caused by a short in the system drawing too much current.) If this ever happens, have a Hyundai dealer determine the cause, repair the system and replace the fusible link. The fusible links are located in a relay box for easy inspection. When replacing a fusible link, never use anything but a new fusible link with the same or lower amperage rating. Never use a piece of wire or a higherrated fusible link. This could result in serious damage and create a fire hazard.